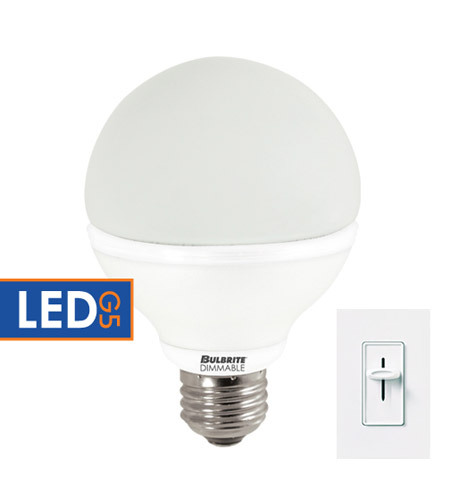 Bulbrite 8-Watt Dimmable LED G25 Globe, Medium Base, Warm White LED8G25/O/27K/D. Bulbrite's dimmable LED globes utilize high performance components allowing for: smooth, flicker-free dimming and high light output. Bulbrite's LED Globes have passed third-party performance testing by the Department of Energy, meaning this is an LED you can trust will perform. Bulbrite backs all of it's LEDs with a 3-Year warranty. Ideal for use in residential and commercial applications as an energy efficient replacement for standard incandescent globes. Optimized driver offers smooth dimming and is compatible with a wider variety of dimmers.